When choosing a property management accounts package one of the most important factors to consider is the quality of the financial reports that can be generated. These reports need to be easily understood by every member of your organisation and even further afield. It is essential that they are well designed, displaying complex financial information in a simple and concise format. The service charge year end accounts mentioned earlier are a prime example of this. 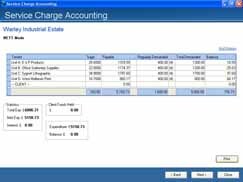 Another example of a well designed, easy to understand accounting report is the cashbook reconciliation. This facility is very flexible allowing you to reconcile your cashbook either once a month (to comply with RICS regulations) or more frequently if preferred. 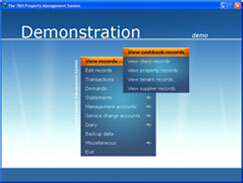 The on-screen reconciliation details all income and expenditure in a clear grid format. From this you can highlight which transactions show on your bank statement. The on screen bank balance will then automatically adjust taking into account any unpresented expenditure or uncleared income. Another time saving feature is the ability to group certain transactions together. For example, if you have banked numerous cheques together on one paying in slip you can group them by batch. When you then reconcile the cashbook it will show them grouped as one amount, matching the activity at bank exactly. This simple but invaluable tool helps to make the cashbook reconciliation easier and more efficient. The system is packed full of accounting reports such as audit trails, cashbook reports, client statements, service charge reports, service charge year end accounts, anticipated expenditure reports, payment reports, cash analysis reports, interest calculation reports, arrears reports, direct recharge apportionment reports and data exports, to name but a few. You are sure to find the report that you need and if it's not pre-set then you can always design your own using the new interface grid screens or the integrated report writer facility. Service charge accounts at the touch of a button. Easily reconcile your cashbook with our on-screen reconciliation. Use the new interface grid screens to draw up your own reports.